Some 100 species of birds are what scientists call "obligate brood parasites"--instead of building nests and raising their own young, they lay their eggs in the nests of other species and let those birds do the hard work of parenting for them. The black-headed duck of South America is one of these, but it stands out from all the others in a striking way. Black-headed ducks don't need any parental care other than incubation for their eggs--the ducklings leave the nest one day after hatching and paddle off into the reeds to fend for themselves. "There doesn't seem to be much if any cost to the host species, so you wouldn't expect there to be much pressure on the hosts to evolve defenses against this kind of parasitism," said Bruce Lyon, a professor of ecology and evolutionary biology at UCSC. When Lyon and John Eadie of UC Davis set out to study the black-headed ducks, they expected to find a highly successful brood parasite, unopposed by the antagonistic strategies that host species deploy against more costly parasites like cuckoos and cowbirds. Instead, they found that black-headed duck eggs are often rejected from host nests, and it took four years of detailed field research to figure out why. Lyon and Eadie published their findings in the November 18 issue of the journal Nature. The key breakthrough was their discovery that each of the black-headed duck's two main host species--the red-gartered coot and red-fronted coot--were busy parasitizing the nests of their own species. The black-headed ducks were being thwarted by defenses that had evolved as a result of brood parasitism among the coots themselves. The researchers carefully investigated the costs of duck parasitism to the hosts and found few costs that could be prevented by rejection of the duck eggs. In contrast, the intraspecific (within the same species) brood parasitism taking place among the coots is very costly to the hosts because they end up feeding and raising the young of other birds at the expense of their own young. Intraspecific brood parasitism in the coots also helped explain a puzzling feature of the parasitic duck eggs. Other obligate brood parasites lay eggs that mimic the eggs of their hosts, but the eggs of black-headed ducks don't look anything like coot eggs. A black-headed duck's big white egg stands out like a sore thumb in a nest full of speckled brown coot eggs. Apparently, the ducks have been unable to gradually evolve egg mimicry because their hosts are already attuned to detecting eggs laid by other birds of their own species, Lyon said. Mimicry would clearly be an advantage, because parasitic eggs of other coots are not rejected as often as duck eggs. But the black-headed duck eggs differ from coot eggs in so many fundamental ways that any incremental change in egg size or coloration would not yield an advantage for the ducks and would not be favored by natural selection. The researchers confirmed this idea experimentally by adding painted eggs to coot nests. They found that improving the degree of mimicry had no effect on the likelihood of egg rejection. "They're just stuck, without much wiggle room for improving their success. There's no way for gradual evolution to bring them into the zone of egg mimicry," Lyon said. With different hosts, the black-headed duck's kinder, gentler version of brood parasitism might have been a highly successful evolutionary strategy. Instead, the species finds itself evolutionarily stranded, caught in the cross-fire of an internecine conflict among its hosts. "The adaptations that have arisen in coots to deal with the high costs of intraspecific brood parasitism have, in effect, inoculated this system against further coevolutionary adaptations on the part of the parasitic duck," Eadie said. Interestingly, Lyon and Eadie's findings in South America are very similar to the results of an experiment conducted 30 years ago by ecologist Milton Weller with American coots in Iowa. American coots engage in brood parasitism within their own species, but are not parasitized by other species. When white chicken eggs were added to their nests, they rejected some but not all of them, much like the response of the two South American coot species to black-headed duck eggs. This supports the idea that rejection of the black-headed duck eggs is an incidental byproduct of the intense reproductive battles going on within the host species. But this raises another question: If the duck eggs are so obvious, why aren't they all rejected by the coots? In fact, Lyon and Eadie observed that egg rejection rates rose to 100 percent during flooding or high waves in the wetlands, when the coots were frantically trying to build up their nests. Both species of coots appear to be able to recognize and reject duck eggs when they need to, but apparently do not always do so. "It's still a mystery why the coots don't reject all of the duck eggs. We need to know more about the cognitive processes involved in egg recognition and rejection by the coots," Lyon said. Lyon has conducted extensive research on intraspecific brood parasitism in American coots. He has found, for example, that an ability to "count" the eggs in their nests plays an important role in their rejection of parasitic eggs of their own species. Despite his familiarity with American coots and their parasitic habits, however, Lyon said it was not obvious that the same thing was happening in the two South American species. "Of all people, I should have been able to see this," he said. But intraspecific brood parasitism is notoriously difficult to detect. Lyon and Eadie conducted a large-scale study of the black-headed duck involving several different wetlands in Argentina, observations of almost 2,000 potential host nests, and several different experiments that involved manipulating the contents of nests. It was only in the fourth and final year of the study that the importance of intraspecific brood parasitism became apparent. "For some reason it was really prevalent and noticeable that year, and finally we had an explanation for the anomalous results we had been finding," Lyon said. Relatively little was known about the black-headed duck before this study, aside from a single-year study conducted by Weller over three decades ago. It had been thought that they exploited a wide range of host species, but Lyon and Eadie found that the ducks focused their parasitic efforts on the two species of coots, only occasionally laying eggs in the nests of other species. Thus, black-headed ducks appear to be specialist brood parasites, relying on the two coots to eke out a living, Eadie said. Obligate brood parasitism has evolved separately in five different families of birds. The "obligate" part of the phrase means they have no other option--they never build nests or raise their own young, so they are obligated to parasitize others. The black-headed duck, with its precocial young and lack of egg mimicry, is a real oddball in this group. Although he can only speculate about why brood parasitism arose in the black-headed duck in the first place, Lyon said one possibility is that the coot hosts offer good protection of eggs from predators. "Coots are pretty pugnacious, and their nests don't suffer a high predation rate, so the ducks may have higher success through parasitism despite the frequency of egg rejection," he said. As for predation of the day-old ducklings after they leave the host nest, Lyon said they must be good at hiding because there are a lot of predators in their wetland habitat. "We never see them after they leave the nests. We'd like to put radio transmitters on them to find out where they go," he said. 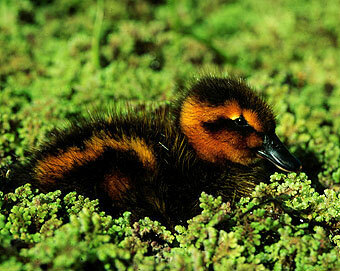 The black-headed duck may be in a precarious situation considering that adverse environmental conditions, such as flooding or high waves, can lead to increased egg rejection by their hosts. If environmental change, such as global warming, causes more frequent flooding of the wetlands, the ducks could be in trouble, Lyon said. Lyon and Eadie's research was funded in part by the National Geographic Society and the British Broadcasting Company.